Recently, while driving down Route 20 West toward Sudbury, I stopped at Post Road Liquors in Wayland. I have been to this wine store before though it had been awhile since my last visit. I was pleased to find that it still was as good as before. Post Road Liquors is associated with Upper Falls Liquors in Newton and Auburndale Wine & Spirits which is also in Newton. It is a family operation, intended to service the Metrowest area. I have not been to their other two stores. Post Road Liquors is a large store, selling wine, beer and liquors. They have a very good selection of wines, at all price points and from wine regions all over the world. They also carry over 300 types of beer, domestic and imported. Wine prices are average plus they have discounts for quantity purchases. You get 10% off 6 bottles or more and 15% off 12 bottles or more. Plus, each month they mark a certain type of wine as special and you get a generous 20% discount off 6 bottles or more. For April, all American wines were on special. One of my favorite things about this wine store is that they are one of the few places that sells Turtle Creek wines, locally made wines that are exceptional values. So while I was there, I found some Turtle Creek Chardonnay, Pinot Noir and Syrah. They usually sell for $19.95 each (which is a good value) but due to their April special I got 20% off as I bought over 6 bottles. Essentially, each bottle only cost me $16. And the Turtle Creek wines sell out quickly. If you are in the area, you definitely should stop and check it out Post Road Liquors. UPDATE: It appears that my column is not in the April 30 issue as planned as the newspaper was inundated with other items that needed to be in the paper prior to the Town Meeting on May 5. My column should be in next week's issue. My new column of "A Passionate Foodie" can be found in the April 30 issue of the Stoneham Sun newspaper. This is a weekly column that concentrates on reviews of local restaurants though it may also touch on a few other food and wine topics. The new column has been published today and will soon be available online as well. The new column is a restaurant review of The Elephant Walk, a Cambodian & French restaurant with locations in Waltham, Cambridge and Boston. It has excellent food, at reasonable prices, and is well worth a visit. The Lower Falls Wine Co. is having a special wine tasting with wine maker Pete Seghesio on Thursday, May 1, from 5-6:30pm. "We are thrilled to be welcoming back old friend Pete Seghesio. For someone with such an impressive level of achievement, Pete remains as affable and down to earth as when we first met twenty years ago.... Actually - perhaps he has to, given that we've spent many a festive evening together. The Seghesio family has been making wine in California since emmigrating from Piedmont in the late 1800s. Zinfandel has always been their life blood. In recent years, they've garnered a bevy of awards for their opulent and seductive single-vineyard projects. The fourth generation has firmly established themselves as one of the "first families" of Sonoma grape-growing. Long one of our favorite California producers, we are anxious to taste the full line under Pete's tutelage. We hope you will join us for this special event! Seghesio might just become your new BBQ sauce...."
Seghesio Family Vineyards makes several different types of wine, from Pinot Grigio to Pinot Noir though they are probably best known for their Zinfandel. Why not stop by and meet Pete Seghesio and taste his wines. It is WGBH auction time again! I bid on some items in last year's auction, though I did not win anything. But I will likely bid again this year. The auction does appeal to foodies as there are numerous food and wine items up for bidding. This year, they will have gift certificates to places like Union Oyster House, Blue Ginger, Top of the Hub, Bistro 5, Teatro, Tasca, and many more. There will be special wine dinners and chef's tasting menus. There will also be a number of different wines included in the Auction. There are plenty of items that I know will interest me and others. Bidding opens on May 1, but in the meantime, you can view some of the Auction's items and register to be among the first to bid online. So check it out, keep an eye on what is added and I hope that you win something if you do bid. I just hope you don't win if it is something I bid on. A new wine store will open on May 7 in Braintree, and it could be the Filene's Basement of wine stores. Today's Boston Herald had an article "Wine Dealer Aims At close-Out Market" which discusses this new wine store. The new store, Bin Ends, will be an "...off-price, specialty fine-wine retailer devoting two-thirds of its 400 selections to bind ends ---overstock, inventory-reduction and closeout bottles offered at discount prices." The bin-end bottles will be marked down every three weeks, first by 25%, then 35% and then 45%. Prices will range from $6-$200 but most will range from $12-$25. They will also sell their wines online. The owners hope to open two more stores within two years. This is certainly an interesting concept. I know many wine stores have a tiny section of bin ends and I have on occasion bought a few. Often, when a new vintage is due in, the old vintage is sometimes discounted, dependent on the wine. Yet the selection at these tiny bind ends has usually not been that good. But a store concentrating on bin ends would hopefully have a much better selection. The new wine store is sure to attract bargain hunters, and with the rise of the value of the Euro, people may begin seeking out more bargains if the new European wines start becoming too pricey. I am curious too as to which new wines they will sell, whether it will be the "usual suspects" or whether they will buy outside the box and seek less common wines. Though their website is up. not much is there yet. Though they seem very social media savvy, on Facebook, Twitter, Pownce and Linked In. You can sign up for future updates. Plus, they even have a blog. So check out their site and I will report back once I visit their shop. Today is the second edition of Wine Book Club. In the spirit of Lenndevours' Wine Blogging Wednesday, Dr. Debs of Good Wine Under $20 has founded the Wine Book Club. This is a chance for wine bloggers to catch up on their reading and to share their insights on the books they have read. Every other month a book will be chosen by a wine blogger for review. All participating bloggers will read the book and post a review of their thoughts on their blogs. Those who do not have a blog can write a review and send it to the hosting wine blogger or on the Wine Book Club sites on Shelfari or Facebook. Tim of Winecast chose the second book for Wine Book Club. This is Noble Rot: A Bordeaux Wine Revolution by William Echikson. Noble Rot, which is now in paperback for $14.95, is 300 pages long and was a much easier read than the previous Vino Italiano. Not only is it a shorter book, but it is an easier read as well. Noble Rot is a history book, centering on the Bordeaux region of France. Though the history extends back to the nineteenth century, most of the book centers on the last twenty-five years. Its main theme are the sweeping changes that have affected this wine region. I read a lot of history and found this book to be very engaging. It is an easy and interesting read which anyone might enjoy. Robert Parker is a central focus of the book as his opinions on Bordeaux wines have had a major impact during the last twenty-five years. A generally balanced view of Parker is depicted, though it may lean a bit more on the positive side. Chateau d'Yquem, and its legendary Sauternes, are also a prime focus of the book. I think one of the most important issues raised in this book is how change is inevitable in the world of wine, and that wineries often need to adapt to those changes, or be left behind. Tradition is good, but not to the point where the quality of the wine suffers. Adaptation is crucial. It may be marketing forces that lead to that change, or simply a better technique. This is also what those warning of the dangers of climate change have been saying, adapt or face negative consequences. And it is not only wine makers who must adapt. Everyone in the wine industry, including us bloggers, must be willing to adapt when necessary. In fact, wine bloggers can be seen as a new technique that has led to a need for others in the wine industry to make changes. And those changes have been slow in some sectors of the wine industry who have been unsure how to handle the phenomenon of wine blogging. Noble Rot is a good book and one I would recommend to anyone seeking out a history of Bordeaux, as well as a look at some of the changes that have affected the modern wine industry. Thanks to Tim for choosing an interesting and engaging book. Wine points are all around us. Many retailers tout scores in efforts to get people to buy wines. And such marketing is effective as there are a significant amount of people who do buy their wines based on wine scores. But can such scores be trusted? Do the wine "experts" basically agree on scores for the same wines? This topic is starting to get trite. It has been discussed time and time again here and on plenty of other wine blogs. Yet I had to raise it again because of a recent incident that brought it before my eyes once again. While researching the wines of Paolo De Marchi, I saw some conflicting scores for his Cepparello wine. First, the April 2008 issue of Decanter had an article declaring the Cepparello to be one of Italy's 50 Greatest Ever Wines. It did not score any of the vintages but stated it was consistently excellent. The aticle was based on questions asked of 19 Italian wine experts from four different countries. Second, the Wine Advocate gave 94 points to the 2003 Cepparello and 95 points to the 2004 Cepparello. This would seem to be in sync with the Decanter article. Third, Steven Tanzer gave 93 points to the 2003 Cepparello and 89+ points to the 2004 Cepparello. So he felt the 2003 vintage was better and his score for the 2004 differed by 6 points. Lastly, the Wine Spectator gave 88 points to the 2003 Cepparello and 86 points to the 2004 Cepparello. So their score difered from the Wine Advocate by 6 points for the 2003 AND 9 points for the 2004. 9 points??? That is a very significant difference. Why is it so different? Let us look at the tasting notes for the 2004 to see if we can get a clue. Wine Advocate: "The estate's 2004 Cepparello (100% Sangiovese aged in French oak, 1/3 new) was made from minuscule yields of just 600 grams per plant and is even better than the 2003. It exhibits a livelier color, fresher aromatics and a nuanced personality, all the products of a more balanced growing season. It boasts layers of vibrant fruit intermingled with subtle mineral and licorice notes, showing outstanding length on the palate and fine, noble tannins. A wine of extraordinary elegance, it has been stunning on the two occasions I have tasted it so far. That said, readers who want to experience this wine's full array of tertiary notes will have to give this wine time to mature in the bottle. It is highly recommended. Anticipated maturity 2009-2022." Wine Spectator: "Aromas of black cherry and flowers follow through to a medium body, with fine tannins and a delicate finish. Sangiovese. Best after 2008." I cannot see based on those tasting notes why the Wine Spectator did not give a higher score to this wine. They did not indicate any problems with the wine. So which score should would you follow? And why? What I think it indicates is that wine scores are really so personal a matter, that wine preferences vary greatly from person to person, that scores don't have a lot of value. If even the wine experts can vary so significantly in their scores for a wine, then where is the value in those scores? Let your own taste be the ultimate judge of whether a wine is good or not. You can sample this new liquor at a party that is being hosted by Beija at RumBa, a Rum & Champagne Bar at the Intercontinental Boston on Saturday, May 3, from 10pm-2am. RumBa has selected Beija as their 100th rum! This should be quite the party with two DJ’s, a full ice bar, champagne mojitos, midnight sweet treats and original Beija cocktails. There is no cover or guest list. Dress to impress. They are expecting 250-300 people, so feel free to invite friends! If you have any questions, please send an email to Kevin@Beija.net. On Saturday, May 3, the Spirited Gourmet in Winchester will hold a Grand Tasting of the Wines of the World. This free wine tasting will be held from 3-7pm and will have over 50 wines available for tasting. Light hor d'oeuvres will be served. There will also be a chance to win a Mother's Day Gift Basket worth over $100. The Belmont location will be having their own Grand Tasting on May 17. Last Wednesday, I had the distinct pleasure of meeting Paolo De Marchi, a famed Tuscan wine maker. Eric Olson, the owner of Salem Wine Imports, is an old friend of Paolo and hosted a tasting of Paolo's wines at his store. Paolo's wines are locally distributed by Martignetti Companies. First, let me say that Paolo was such a nice person; humble, personable, down-to-earth and very knowledgeable. And he is extremely passionate about his wines. He definitely impressed me with his personality as well as his wines. It was also interesting to learn that he was good friends with Christoph Künzli, the winemaker of Le Piane who I met last February. Paolo's winery is named Isole e Olena, which is taken from the two separate vineyard blocks of Isole and Olena. Paolo has dedicated much time researching and testing different viticultural techniques as well as various Sangiovese clones. He was also a pioneer in introducing foreign grapes such as Chardonnay, Cabernet Sauvignon and Syrah. In Tuscany, a number of producers were adding Cabernet Sauvignon or Merlot to their Chianti Classico Syrah to give it more color, and to give it a more international flavor. At that time, Paolo considered using Syrah to add some color and depth to his Chianti Classico. He felt that Cabernet could overwhelm the Sangiovese and he was not concerned about appealing to the international flavor. But in the end, he decided not to add any Syrah. He felt the solution instead lay in carefully finding the right Sangiovese. To Paolo, he wanted his wines to reflect Tuscany, and not some international flavor profile that could come from almost anywhere. Thus, the key was Sangiovese, finding the best grapes, carefully working in the vineyards. For Paolo, the grapes and vineyard became paramount. What occurred after the grapes were picked was much less important. Based on the wines I tasted, Paolo certainly has proven to me that he knows how to create great wines. Paolo has two labels, Isole e Olena for his Sangiovese based wines and Collezione De Marchi for his more international grapes like Chardonnay and Syrah. As a special treat, we also got to taste some wine from Paolo's son' label, Proprieta Sperino, which are Nebbiolo based wines from the Piedmont region. I began the tasting with the 2005 Isole e Olena Chianti Classico (about $22). This wine is a blend of about 80-85% Sangiovese, 10-15% Canaiolo, and maybe up to 5% Syrah if necessary that vintage. About 14,000 cases of this wine were made this vintage though the norm is about 10,000-12,000. The wine has an alcohol content of 13.5%. This Chianti was a light red in color with a subdued cherry nose and a touch of herbal notes. On the palate, it was smooth and restrained with bright cherry flavors, a touch of earthiness and mild herbal notes. It had a decently long finish and was quite delicious. It may be a more subtle and elegant wine that you would expect, especially if you are used to more international style wines that are more fruit forward. I found this to be one of the best Chiantis I have tasted in some time. It would be a perfect food wine and it was a big hit at the tasting too. Many of the people I spoke to loved this wine. And at the price, this is an excellent value wine as well. This wine gets my highest recommendation. Next up, the 2004 Isole e Olena Cepparello (about $56), which I absolutely loved. "Cepparello" is the name of a creek, which is now dry. The wine is made of 100% Sangiovese and has an alcohol content of 14%. Only the best Sangiovese grapes, from several different vineyards, are used for this wine. The DOC rules used to prohibit Chianti Classico from being made solely from Sangiovese. So this wine had to become something else, and thus became Cepparello. Though the DOC rules have since changed, it seems unlikely Paolo will change the Cepparello as it has taken on its own fame. The Cepparello spends about eighteen months aging in French oak, one-third new oak. This wine had a medium red color with an alluring nose of cherry and spice. The wine then seduces your palate with its rich, lush flavors of vibrant fruit, spice, and licorice. It is incredibly smooth, with supple tannins, and is also well balanced with a lingering, hedonistic finish. Lots of subtle complexity in this wine, which shows much elegance and style. A superb wine that thoroughly impressed me and tantalized my palate. This is a WOW wine! I understand now why the Cepparello has received so much positive press. Even at its price, it is still a value as it is easily is worth twice the price. This wine also gets my highest recommendation and I made sure to buy some of it. We then moved on to his son's winery, Proprietà Sperino in the Piedmont region. That is where Paolo's family originated. The first wine we tasted from this winery was the 2004 Proprietà Sperino Uvaggio (about $25). "Uvaggio" in Italian means a blend of grapes, generally done before fermentation as opposed to a "Vinaggio," a blend of already made wines. This wine is a blend of 65% Nebbilo, 20% Vespolina, and 15% Croatina. It has an alcohol content of 12.5% and is fermented in open oak vats. It is also is aged for a short time in French oak, none which is new. The Uvaggio has a medium red color with a delightful nose of strawberry and cherry. On the palate, this was an interesting wine with those same strawberry and cherry flavors combined with only a touch of spice notes. The mild tannins made for a smooth, easy drinking wine. There was also some complexity in the flavors of the wine, taking beyond a simple fruity wine. It had a moderately long finish and was pleasing to the taste. We moved on to the 2004 Proprietà Sperino Lessona comes from the village of Lessona. It is made from nearly all Nebbiolo with a little bit of Vespolina. It has an alcohol content of 13% and is fermented in open oak vats. It is also is aged for a short time in French oak, none which is new. This wine seemed a bit lighter red than the Uvaggio. On the palate, the wine seemed a bit tart to me, with more sour cherry and raspberry flavors. There was only the barest hint of spice. The wine did have a long finish and was that same elegant style as the other wines I had already tasted. Its tartness though was not to my liking so I did not care that much for this wine. But, there were others at the tasting that preferred the Lessona to the Uvaggio, showing you that taste is largely a matter of personal preference. It was now time to move on to the Collezione De Marchi wines. First up, the 2006 Collezione De Marchi Chardonnay (about $33). This wine has an alcohol content of 14% and has been barrel fermented. It also spends a year in oak on the lees. The wine had a light yellow color and the nose had a bit of an oaky/yeasty smell. Yet on the palate, neither of those really appeared. I had almost been expecting a typical California Chardonnay but I was wrong. The wine was more crisp than creamy. It had nice fruit flavors of apple and melon with some mineral notes as well. An elegant wine with a good, long finish. This is the type of Chardonnay I enjoy and which I would recommend. I moved on to the 2004 Collezione De Marchi Syrah (about $52). This wine had an alcohol content of 13.5% and was aged for one year in small barrels, with about 25% new oak. This dark red wine had an intriguing nose of dark berries and spice. It was certainly a rich, muscular wine with vibrant black cherry, blackberry and ripe plum flavors. Though there were spice notes in the wine, it was not that bold spice found in some Syrahs. Even a touch of earthiness. This was a more elegant and complex Syrah. A luscious, smooth taste with a lingering finish. This reminded me more of a Rhone wine than an Australian Shiraz. It certainly did not lack in flavor yet it never overwhelmed. Another excellent wine by Paolo. Finally, I tasted the 2001 Collezione De Marchi Cabernet Sauvignon (about $55). This wine had an alcohol content of 13.5% and was aged for two years in small barrels, with about 50% new oak. This wine was lighter in color than the Syrah and had an alluring nose of dark berries. This was also a rich, muscular wine with more blackbery and plum flavors. It had less spice than the Syrah though there were still noticeable hints of vanilla. The tannins were very smooth and this wine went down very easily. A complex and elegant wine that is sure to please. All three of the Collezione De Marchi showed that Paolo is not trying to imitate an international style. He is forging a path of his own, making good wine and trying to let the grapes speak for themselves. These are not "in your face" wines. They all have far more elegance and subtlely. They are also likely to be different from many other wines made from these grapes that you might be used to, unless you drink more Old World style wines. Unfortunately, Paolo did not have available for tasting his Vin Santo, considered a top Italian dessert wine, and his Rose, made from Nebbiolo. I will be sure to hunt them down though. Overall, this was an exceptional tasting and it was such a pleasure to meet Paolo and hear him expound on his wines and wine making philosophy. I loved to see the passion in his eyes when talking about his wines. And I will definitely enjoy drinking his wines. The Chianti Classico and Cepparello impressed me the most though I also very much enjoyed most of the other wines. If you get a chance to go to a wine tasting with the wine maker present, I strongly recommend you do so. Speak to those passionate men and women who make the wine you enjoy. Learn more about those wines directly from those responsible for crafting the wines. You won't be disappointed. I am eating Italian food for dinner tonight. I think I will open a bottle of the Isole e Olena Chianti Classico. Pacific International Liquor, Inc., which was established in 1997, specializes in the import and export of Asian liquors. They had several different brands of Saké available for tasting. The first Saké I tried was the Kurosawa "Black River" Junmai Daiginjo from the Nagano region of Japan. This was an excellent Saké, not too floral with some subtle fruit flavors and a clean, smooth taste. Next up was the Hatsumago Shozui "First Grand Child" Junmai Daiginjo from the Yamagata region. This Saké was more full bodied, with a richer, creamier mouth feel. It had more floral than fruit flavors with plenty of complexity and a long finish. Then I tasted the Kurosawa Junmai Kimoto from the Nagano region. A very nice Saké with good fruit and a bit of an earthy taste to it as well. Very smooth and clean taste that makes you desire more. The final Saké I tried was the Okunomatsu Ginjo from the Fukushima region. Crisp, smooth, and clean with excellent fruit and plenty of complexity. Such great flavor that this too was another of my favorites of the tasting. Saké Sunday: UNLVino & Dreyfus Ashby & Co.
Another Sake table was run by Dreyfus, Ashby & Co., an international importer and marketer. Around 1985, the Maison Joseph Drouhin firm took financial control of Dreyfus, Ashby. Joseph Drouhin is a Burgundy wine grower and négociant in France. They concentrate on high quality wines and liquors and their portfolio includes many different countries, from France to Switzerland, from Spain to India. They import Saké from one Japanese brewery, Hakutsuru, which was established in 1743 and is one of the oldest Saké producers in Japan. The word "Hakutsuru” means white crane, a graceful bird. The brewery is located in Kobe, in the heart of the Nada region. The Hakutsuru Superior Junmai Ginjo ($9 for a 300ml bottle) was light with excellent fruit flavors. It was a smooth and crisp Saké, so easy to drink. Some complexity plus it was well balanced. This is exactly the type of Saké I love. It is something I could sit and drink all night long. It would also go well with food, especially Sashimi. An excellent choice for someone new to Saké. This was one of my favorites of the tasting. I also tried the Hakutsuru Sho Une "Soaring Clouds" Junami Daiginjo ($24 for 720 ml). This is their highest quality Saké and I too enjoyed it very much. It has more floral notes on the nose and palate. It is also more complex and has a longer finish than just the Ginjo. It is very smooth and well balanced. You lose some of the fruitier elements and get a bit more of rice and a nutty taste. At the price, this is an excellent value for a Daiginjo. As it has more floral tastes, I think this is better with food. It is not something I would just drink all night, without food, like I would the Ginjo. This Daiginjo is certainly comparable to others that sell for $100 or more. Are you a big deal? Do you have what it takes? Are you the next Top Chef? Do you KNOW you could mop the floor with the chefs on Bravo's smash hit competition series? Well, here is your chance to make it happen! We are now casting for Top Chef Season 5! Chefs with a passion for food, creativity, a thorough knowledge of cooking techniques and trends and oodles of charisma are what we're looking for. We want both self-taught cooks and those who have trained at top culinary schools. DOWNLOAD AND FILL OUT THE APPLICATION at Bravotv.com/casting , make your video and send to us ASAP. The sooner you get the application and video to us the better! I received some excellent news this bright, sunny morning. Chef Stephen Bell, formerly of Savory Tastes Cafe in Reading, will soon be the Executive Chef at a North shore restaurant. As you may remember, Savory Tastes Cafe closed last fall and to me, it was the saddest culinary event of 2007. Savory Tastes Cafe had been one of my favorite restaurants and it was shocking that such a talented Chef had to close his beloved restaurant. But Chef Bell is returning to another restaurant and that is certainly a reason to be joyful. The exact location of the restaurant has not yet been announced, but will be sometime during the next few weeks. During the next month, Chef Bell will be working on menus and other items for his endeavor. We do know that the new location will have a full bar with televisions and more seating. Chef Bell also hopes to bring back his monthly theme events. I am very excited about this news. I will definitely check out his new restaurant as soon as it opens. Chef Bell is a very passionate man and I fully expect that he will ensure this new endeavor lives up to the same high standards as the former Savory Tastes Cafe. When I get more information about the restaurant, I will be sure to report back. Famed Chef Jody Adams of Rialto will be hosting a special wine dinner on Monday, April 28, at 6pm, with four women wine makers. The dinner will consist of four courses, each paired with a wine from one of the wine makers. Each wine maker will talk about their wines. All four women lead family-run estates with small productions specializing in organic and sustainable agriculture. The dinner costs $100 per person (and includes tax & gratuity). Call 617-661-5050 to make reservations. Memories of my last autumn's trip to Spain. Ah! What a joyous time. I got to relive a bit of those memories this past Sunday when I attended a Spanish Tapas Wine Dinner at Melissa's Main Street Bistro in Stoneham. I chose the wines for this dinner and spoke about them at the meal. And it was a wonderful and fun dinner. If you were not there, you missed out on a very good time. As the meal began, we each received a plate covered by various enticing tapas and three glasses of wine, two whites and a red. The first wine was a Ulacia Txakoli. Nicolas Ulacia e Hijos is a traditional winery located in the heart of Basque country, northern Spain. It is a small family-owned estate that has been around since the 1940’s. They only produce about 6,000 cases of wine each year, most of which is consumed locally. Txakoli is a light, white wine. It is a blend of two grapes: 85% Hondarrubi Zuri, a white grape, and 15% Hondarrubi Belza, a red grape. The wine is pale yellow in color with a vibrant aroma of green apple and minerals. It has a slight, refreshing effervescence to it and is high in acidity. But it is only 11% in alcohol. This wine pairs well with many foods, especially salty or oily foods. I recommended that the Txakoli go with the Honey Roasted Marcona Almonds, Manchego Cheese, and Membrillo, though also suggested that everyone try it with some of the other tapas too. The Marcona Almonds were delicious as usual, probably my favorite type of almond. And the combination of Manchego with the Mebrillo also makes an excellent pairing. The Txakoli seemed to be a big hit with the other guests and I was asked by several people where they could buy some. The second white wine was the Pazo de Senorans Alabarino from the Rias Baixas region of Spain. Rias Baixas is located in Galaicia, in the northwest corner of Spain. Because of the Atlantic Ocean, it has a specific climate that allows the Albarino grape to flourish. Pazo de Senorans, a small, family owned estate, is owned by Marisol Bueno, who has been at the forefront of wine making in this region. The Albarino has a nice crisp taste of green apple and peach with a bit of minerality. It goes well with seafood so I suggested it should accompany the Scallop Ceviche and Salt Cod Cake with Roasted Tomato. The chef also added an extra tapas, a marinated baby octopus to the plate. The Scallop Ceviche came atop a thin, fried banana slice and was quite good. The Salt Cod Cake was also delicious and both went well with the Albarino. The octopus was not as well received by everyone, because it looked just like a baby octopus, but it actually had a good flavor to it. The red wine was the Dominio de Tares "Baltos" Mencia. The Dominio de Tares Estate is located in the Bierzo region, in the northwest of Spain. The Mencia grape is usually very fruity when young, as well as having mineral notes. The older it gets, it becomes more elegant and complex. It is not a heavy red though and gives nice red fruit flavors. The Baltos is not an old Mencia so it is more fruity but with character. For this wine, I recommended the Chorizo Sausage Empanada, Black Mission Figs Stuffed with Goat Cheese & Serrano Ham, and the Petite Sandwich of Spanish Style Braised Pork. And I think they all paired quite well with the wine. The Empanada was very tasty with just the right amount of spicing. The figs were superb and I could have eaten a dozen of them easily. The Braised Pork was like a slider, a small sandwich with very tasty pork inside. The Mencia wine was very popular as well, even by a couple of people who were not big red wine fans. After the tapas, then it was time for our entree and another wine, a red. The wine was the Abadia Retuerta Seleccion Especial from the Ribera Del Duero region. Founded in 1996, Abadia is an interesting fusion of high tech and tradition. Its wine making facility is very modern, utilizing much of the latest technology. But there is also a 12th century monastery on the property. I actually visited the winery this past fall. The Seleccion Especial is a blend of 75% Tempranillo, 20% Cabernet Sauvignon and 5% Merlot. The wine spends 18 months in oak and has an alcohol content of 14%. This wine has a dark red color and a very aromatic nose with more more spice, like cinnamon, rather than fruit. The wine has a rich body and on the palate it has a good balance between fruit and spice. It is a very smooth wine, with mild tannins, and a fairly long finish. The entree consisted of a very generous portion of sliced Flank Steak A la Plancha with Patatas Bravas (Spanish Potatoes with Red Pepper and Garlic Aioli) and Olive Oil Roasted Brussels Sprouts with Cabreles Bleu Cheese. What a delicious entree! The steak was tender and flavorful, and went very well with the Bleu Cheese. The potatoes were cooked just right. And there was so much food, especially considering how large the tapas plate had been. The wine went perfectly with the entree and it too was a very popular wine. Yet just when you thought you could eat no more, dessert was still forthcoming. For a dessert wine, I chose the Castano Monastrell Dulce from the Yecla region, which is located not far from Spain's east coast. Bodegas Castano has been involved in winemaking for generations. The vast majority of their vineyards are planted with Monastrell. And this wine is made form 100% Monastrel. It is a deep, rich red in color with an intriguing nose of candied fruit and prunes. On the palate, it has some sweetness but it is far from cloying. And it has much flavor as well, touches of prunes, figs and dates as well as vanilla and cinnamon. It has some complexity and it very different from many white dessert wines that people may be used to. This wine especially goes well with chocolate. Our dessert plate was like another dish of tapas as we received a bunch of different desserts, including: Candied Fruits and Nuts, Cinnamon Churos with Hot Chocolate, Almond Cake with Poached Pears, Walnut Gourmandise Cheese, Sweet Rioja Gelée with Champagne Grapes and Spanish Coffee Mousse with Roasted Pistachio Cookie. So much food! And it all was absolutely delicious. Some of the desserts were very different such as the Walnut Gourmandise Cheese, but quite tasty. Many people liked the dessert wine, except for a few who just were not fans of sweet wines. Though I did tell everyone about the wines, I also later went to each table a couple times to see what everyone felt about the wines and the dinner. I received a lot of very positive feedback. Most people were unfamiliar with many of the wines but definitely enjoyed them. And they also loved the food. Jason, the Chef, did a superb job on this dinner. The quantity, quality and taste were all top notch. Service was also excellent, deftly handled by Melissa and Samantha. Overall, just a great time. As I had lots of fun, I will likely assist on some future wine dinners at Melissa's Main St. Bistro so I hope to see you there. My new column of "A Passionate Foodie" can be found in the April 23 issue of the Stoneham Sun newspaper. This is a weekly column that concentrates on reviews of local restaurants though it may also touch on a few other food and wine topics. The new column has been published today and is available online. The new column provides some recommendations for restaurants where you can bring your own wine and beer, for no or a low corkage fee. The column also provides some advice for BYOB to restaurants that have a wine list. Over the past weekend, I decided to check out Vinodivino, a wine store in Newton that I had never been to before. I was on their mailing list so I had received notice of their upcoming wine tastings and such. I wanted to check it out, see what it was like. Vinodivino, which has been open for about three years, is owned by Raphael Keller-Go, a former investment banker, and Nancy Keller-Go, his wife. The store manager is Adam Petronzio, a trained chef and former sommelier. The store stocks about 200 wines, with the majority costing under $20. They want to carry many good wines that are affordably priced. All of the wines they stock have scored at least 85 points from the major wine publications. They do carry around 30 cellar wines, that have scored 95 points or higher, and which are priced over $20. The staff at Vindivino also adds their own scores to each wine they sell. Vinodivino is a small, one-room wine store with wine racks covering about three-quarters of the walls, except for the windows looking out onto the street. It has nice wooden racks and the wines are generally separated by grape, with the white wines to your left as you enter the store. Each wine on the racks has an attached wine card providing some detailed information about the wine. It is an added benefit that when you purchase a bottle of wine here, they give you a copy of the wine card. These cards contain the name of the wine, the producer, the latest date when you should drink your wine, an indication of the wine's richness and fullness, the grape varieties, food pairing ideas, wine scores, tasting notes and more. It can be quite handy to have some of this information later at home when you open your wine. The info on the wine cards is also available on their website. Prices seemed average and they certainly have plenty of options under $20. They also have discounts if you purchase 6 bottles or more. They hold free wine tastings every Saturday from 1-5pm plus they have several wines available for tasting all the time in a small, sampling machine. The staff was knowledgeable and helpful. I was present for a Saturday tasting, the Flavors of Spring, which had four wines. The first was the 2005 Aminea Fiano di Avellino ($20), a white wine from the Campania region of Italy. The grape is Fiano, an indigenous Italian grape that I had never had before. It was an intriguing wine with mineral notes, subdud fruit and a touch of earthiness. It was crisp and had a medium body. The wine was fermented and aged in stainless steel. Definitely something different and well worth giving it a try. Next up was a 2006 Williamette Valley Vineyards Pinot Gris ($18.50). This wine is a blend of 91% Pinot Gris, 7% Pinot Blanc, 1% Muscat and 1% Auxerois. Only the Auxerois was fermented in French oak. This was a crisp wine though it had a bit of a creamy feel as well. It had good fruit flavors, including some apple and pear. Overall, a good wine. The 2005 Valle Reale Montepulciano d'Abruzzo Vigne Nuove ($14) is a newer style wine, a ligher approach. It had a medium red color with a fruity nose. On the palate, there were interesting blueberry, plum and black cherry flavors. It had a decent finish and some mild tannins. A good, easy-drinking wine for dinner. Finally, I tried the 2004 Livernano Chianti Classico Riserva ($36). This was also a good wine, though a bit young and which should improve with age. It had nice dark berry flavors with some spice notes. It has a good structure and a moderately long finish. But, I am not sure it is worth the price tag. It did not impress me enough for me to pay $36 for it. I did pick up a couple of bottles of wine while I was there. First, I found a bottle of Golfo 7, a Spanish wine that I very much enjoy but which is hard to find. Second, I picked up, on the recommendation of the staff, the 2004 Alaia Vino de la Tierra de Castilla y Leon. This is also a Spanish wine and an intriguing blend of 50% Prieto Picudo, 45% Tempranillo, and 5% Merlot. My only gripe about this wine store is its over reliance on wine scores. Criticisms of wine scores are everywhere and I have discussed the issue before as well. I won't go into a long rant against wine scores right now. But I think Vinodivino misses out on some excellent, as well as affordable wines, just because the wines have either never received a score or the wines did not receive a score of 85 or higher. Plus, just because a wine has been highly rated does not mean a specific customer will like that particular wine. Since Vinodivino uses wine scores from the major publications, why do they need their own score as well? How many customers just look at the scores and generally ignore the rest of the information about the wines? It is good that Vinodivino tries to deliver quality wine at an affordable price, but I don't think they need to use the scores to accomplish that goal. It is also good that they provide wine cards with information about the wines, but I don't see a need for scores on those cards either. Over the weekend, while I was out and about, I stopped by the Lower Falls Wine Co. for their regular Saturday afternoon tasting, held from 12pm-4pm. As usual, they had some interesting wines available for tasting. The first wine was the 2007 Domaine de Triennes Rose ($15). Domaine de Triennes was founded in 1989 by three men, including two owners of famous wineries in Burgundy. This included Jacques Seyss of Domaine Dujac and Aubert de Villaine of Domaine de la Romanee-Conti. The third man was Michel Macaux, a good friend of the other two men. They sought to buy a vineyard in the Var region of Provence. They eventually bought an existing estate, Domaine du Logis-de-Nans. The estate needed a lot of work but the three men saw great potential in the land. They renamed the estate Domaine de Triennes, after the "triennia," festivities in the honor of Bacchus that took place every three years in ancient Rome. The Rose is a blend of Cinsault, Syrah, and Merlot. As there is a high demand for their Rose, they have had to purcahse grapes from other vineyards to make the Rose. The Rose is a very pale pink in color. It also has an incredible nose of lush fruit, strawberry and even watermelon. On the palate, the vibrant fruit tantalizes your mouth. It has a touch of sweetness but it is far from overly sweet. It has the elegance of an Old World Rose but with a bit more vibrant fruit. A chilled glass of this Rose would be perfect on a summer day. An excellent Rose and I made sure to buy some. The next wine was a 2006 Argillae Grechetto ($18). "Argilla" is the Italian word for clay. Azienda Agricola Argillae is located on the hills between Allerona and Ficulle, northwest of Orvieto, in the Umbria region of Italy. The grape is Grechetto, an indigenous Italian grape that I don't think I had ever tasted before. Though it is used more as a blending grape so I may have had some and not knew it. The wine was a pale yellow in color with a bit of a floral and herbal nose. On the palate, the floral notes remained but there were also some mild fruit flavors. It also had some mineral notes and it was crisp. It was a different type of white wine, not one of the usual suspects. It did not overwhelm me but I appreciated the fact that it had its own unique character. If you enjoy white wines, I definitely suggest you give it a taste. Next was the 2006 Schweiger Vineyards Sauvignon Blanc ($22). Their vineyards are located on Spring Mountain in California. The grapes for this wine though come from the Uboldi Vineyards in Kenwood, California. It is barrel fermented in three to seven year old French oak and does not undergo malolactic fermentation. Only 900 cases of this wine were made. I am not a big fan of Sauvignon Blanc so I was not surprised that this wine did not thrill me. I got a strong grapefruit taste from the wine. It was crisp and clean but just not my preference. The 2006 Cantine Colosi Nero d'Avola ($16) from Sicily was more to my liking. This wine had a moderate red color and a nice nose of cherry. On the palate, there were pronounced bright cherry flavors with some raspberry as well. There were also hints of vanilla and a touch of spice. A smooth, easy-drinking wine that would go great with Italian food. Enough complexity in the wine to make this a value wine. The 2005 Chateau Virgile Cuvee L'Eneide is from the Costieres de Nimes AOC in France. This is a Rhone wine with an alcohol content of 13.5%. I very much enjoyed this wine. It was a more subtle wine, with subdued fruit and spice. It had a moderately long spicy finish with a touch of cinnamon. The tannins were a bit bold but drink this wine with food and it would not be an issue. An interesting and complex wine that is another good example of the quality of the Rhone. And as usual, I could not walk away from Lower Falls without a case of wine. I was able to find a Kamen Cabernet Sauvignon, which I had wanted to try. I was told that the Kamen Cabernets had been big sellers at Lower Falls. I also found some Turtle Creek Pinot Noir, one of my favorite Pinots for $20, and which is also made in Massachusetts. Overall, another fine trip to the Lower Falls Wine Co.
Melissa's Main Street Bistro in Stoneham is continuing their trend of holding special wine dinners on Sunday evenings. I just attended their Spanish Tapas Wine Dinner last evening and it was excellent, and I will post more details very soon. So, you might want to attend their upcoming wine dinners on April 27 and May 4. Both events start at 6:30pm. The cost for each dinner is only $55 (plus tax and tip) which I think is cheap for everything you will get, all that wine and food. Please call Melissa at 781-438-7243 to make reservations for either event. Please make your reservations early so you don't miss out! I skipped the table of Sidney Frank Importing as they only had Gekkeikan Saké and I am very familiar with their product line. Though I am not a fan of much of their line, I am very enthusiastic about their Gekkeikan Horin Junmai Daiginjo ($30). For the money, this is great value for a Daiginjo. I also only made a brief stop at the Takara Saké table. Takara is located in Berkley, California, and I did visit their brewery a few years ago. Two of their major products line include Sho Chiku Bai Saké an their Hana flavored Saké line. I am familiar with much of their product line as well though they did have one Saké that I wanted to try. The Sho Chiku Bai Junmai Nama is an organic Saké with a SMV of +5, making it dry. It had a clean flavor, was dry and refreshing. There were subtle fruit flavors with only a touch of rice tones. A good chilled Saké for a summer day. It sells for about $2.25 for a 180ml bottle so it is very inexpensive as well. I should also note that Takara is responsible for bringing in Kissui Vodka, which I have previously reviewed and enjoyed very much. Saké Sunday: UNLVino & Banzai Beverage Corp. The second Saké table I visited was manned by representatives from Banzai Beverage Group. They are the ones who also ran the Sparkling Saké table at Bubble-Licious. Though they had the Sparkling Saké available again, they also had a few non-Sparkling varieties available as well. I first tasted the Hakurakusei "Legend of Stars" Junmai Daiginjo ($50-60). This Saké is brewed by Niizawa Saké Brewing Co. from the Miyagi region of Japan (no relation to Mr. Miyagi of "The Karate Kid"). They used Yamadanishiki rice. 60% of the rice grain was polished away and its has a SMV of +5, making it dry. This was a nice Saké, more floral than fruity, with some interesting herbal flavors as well. Next, I tried the Jokigen "Happiness" Junmai Ginjo (about $25-30). This Saké is brewed by Sakata Brewery Co. from the Yamagata region of Japan. They used Oyamanishiki rice. 45% of the rice grain was polished away and its has a SMV of +4, making it dry. This Saké had a fruty nose, melon, lychee and other tropical fruits. Those fruit flavors came out on the palate as well. A very smooth, easy-drinking Saké that is sure to please most everyone. This would certainly be a good choice for someone new to Saké. It shows some of the potential complexity of Saké with the myriad of fruit flavors. Finally, I tried the Miyanoyuki "Snow Shrine" Junmai Ginjo ($12 for 300ml). This Saké is brewed by Miyazaki Honten Co. from the Shiga region of Japan. This is a pleasant Saké, smooth and flavorful, but I did not think it was anything special. It was an average Saké, worth drinking but it probably won't impress a Saké fan. Though it would be a very good entry level Saké for someone new to Saké. And at this price, it is a good value. At most Grand Wine Tastings, you are lucky to find a single table with some Saké. That was certainly the case at the Boston Wine Expo. But it was a special treat at the recent UNLVino to find six tables devoted to Saké. Six!!! I was already familiar with some of the Saké but some was very new to me as well. I was quite eager to try the unfamiliar Saké, to find some new treasures. And I was not disappointed. There were a number of excellent Sakés to be found. The first table belonged to SakeOne, a Saké brewery located in Oregon. I was already familiar with most of their Momokawa and Moonstone brands. Their Momokawa Saké are primarily Junmai Ginjos, though they have a Nigori as well. Their Moonstone line are infused Sakés, with flavors including Asian Pear, Raspberry, Plum and Coconut Lemongrass. Both of their lines are produced in Oregon. Of their line, I had not tried before the G Joy, a Junmai Ginjo Genshu ($20). The G line is intended to cater to American palates. I found this Saké to be very smooth, with lots of fruit on the nose and palate. A very easy drinking style that lacks any rice flavors or aromas. I can understand why this is supposed to appeal more to an American palate, especially those who have little experience with Saké. It certainly is a pleasing Saké which should appeal to a wide audience. I also tried a cocktail made with the Moonstone Coconut Lemongrass called Asian Equation. This cocktail is made with 1 1/2 parts Moonstone Coconut Lemongrass, 1 1/2 parts Ty Ku, and 1 part sweet and sour mix. It is then served on the rocks. The Moonstone Coconut Lemongrass is a Nigori Genshu, so it has some sweetness in it. The cocktail itself was quite interesting, with a rich coconut flavor (which I love) and it was not overly sweet. It also had hints of other fruits as well, due to the Ty Ku. This would make a good summer drink. SakeOne also imports Saké through a partnership with Momokawa Brewing in Japan. The Murai family owns the Momokawa brewery and have given their name to a line of imported Saké, the Murai Family. The Murai Family line makes a variety of different Sakés, from Nigori to Dai Ginjo. I first got to taste the Murai Family Tokubetsu Honjozo ($29 for 720ml). This Saké had a strong rice smell though on the palate the rice taste was much milder. It also was very smooth and had some interesting fruit flavors and a touch of herbal notes. I enjoyed this Saké though it might not appeal to those new to Saké, those not used to strong rice aromas. A good price for this quality of Saké. I then got to taste the Murai Family Daiginjo ($69). This is their highest quality Saké. 65% of the rice grain has been polished away. This Saké had a fascinating nose, with a unique blend of fruity and floral aromas. The taste also contained fruity and floral elements in a well balanced mix. It was a smooth Saké with a long finish and plenty of complexity. It had a rich body and definitely would be good paired with light foods. Again, this is not a Saké that is going to appeal to the newcomer to Saké, but those who are already fans should definitely appreciate this fine Saké. Last Saturday, I led a group of the North Shore Winers to the special SpringFest 2008 Wine Tasting at the Winecellar of Silene in Waltham. There were about 28 wines available for tasting, mostly from California with a few others from Oregon and Washington. All of the wines were discounted, about 10-20% off. Overall, this was an enjoyable tasting with some excellent wines. The attendees I spoke with all liked the tasting and many bought some of the wines. There were some standard types of wines, such as Chardonnays and Cabernets, but there were some more unusual wines as well, such as a Charbono and a California Sangiovese. Prices, after the discount, ranged from $9.99 to $49.99. Here are the wines that especially impressed me, with their usual prices. 2006 Summers Estate Winery Charbono ($26.99): Charbono is a less common grape that is only grown in California, though there are few producers. Summers claims to produce the most Charbono wine of any other winery, about 2000 cases a year. Summers has vineyards in Knights Valley as well as Napa Valley. The Napa Valley property has a vineyard designation of Villa Andriana Vineyard, named after Summers' daughter. It is this vineyard that produces the Charbono. This Charbono only has an alcohol content of 13.2% and is moderately red in color. It has a fruity nose and on the palate you get dark berries, plum and a bit of spice. The taste is also dry and dusty which enhances the taste of the wine. It definitely presents a more unique taste. It is a smooth wine, with mild tannins, and a moderately long finish. Definitely a wine to try, especially if you are seeking something a bit different. 2006 Belle Glos Pinot Noir, Clarke & Telephone Vineyard ($52.99): The famous Caymus Vineyards produces renowned Cabernets as well as one of my favorite white blends, Conundrum. Now the Caymus family has begun to produce Pinot Noir. The wine maker at Belle Glos is Joseph Wagner, who chose the name to honor his grandmother, Lorna Belle Glos Wagner, a co-founder of Caymus Vineyards. Belle Glos produces single-vineyard Pinot Noirs from some of California’s top wine-growing regions. Based on the wine I tasted, I believe Belle Glos is soon going to become very famous for their Pinots. The Clark & Telephone Vineyard is located near the corner of Clark Avenue and Telephone Road in the Santa Maria Valley. The vineyard is about 35 years old and was planted “own root” to the Martini clone. This heirloom clone of Pinot Noir, one of the first to grace the California coastlands, has become something of a lost treasure. This was an exceptional Pinot. It was light red in color with an intriguing nose of dark berries and spice. On the palate, there was a complex melange of flavors, plum, blackberry, raspberry, cinnamon and other subtle spices. The whole wine was more subtle, more Burgundian in style. It was very smooth, with well integrated tannins and a delightful lingering finish. Just an amazing taste that mesmerized me and I knew I had to buy a few bottles. I will definitely seek out their other Pinots too. 2004 Arrowood Cabernet Sauvignon, Sonoma County ($51.99): Arrowood Vineyards are located in Sonoma County and Richard Arrowood is the wine maker. He has been involved in wine making for over 40 years. Interestingly, the winery is modeled after a New England farmhouse. This Cabernet is a blend of 89.9% Cabernet Sauvignon, 7.2% Merlot, 1.6% Malbec and 1.3% Petit Verdot. It was aged for about 24 months in French and American oak and is unfined & unfiltered. It has an alcohol content of 15.2% and about 6,043 cases were produced. The 2004 vintage was considered exceptional. This wine was a dark red in color with a nose of blackberry, spice and cocoa. On the palate, the wine is lush with ripe plum, blackberry and blueberry flavors mixed with spice, leather and cocoa. It was a rich, muscular wine yet well balanced. The tannins are integrated well and the wine has a very long and delicious finish. An opulent wine with plenty of character. An exceptional Cabernet, especially at this price. I had to buy this wine as well. 2005 Il Cuore Rosso Classico ($12.99): "Il Cuore" means "the heart" in Italian. Located in Mendocino County, the winery makes Cabernet, Chardonnay, Barbara, Rose, and the Rosso Classico Tuscan Style blend. This wine was a blend of 47% Zinfandel, 24% Merlot, 21% Malbec and 8% Barbera. It has an alcohol content of 14.3%. This wine was a light red in color and was a relatively light wine on the palate as well. It was a smooth, easy-drinking wine with lots of good fruit flavors and a touch of spice. Cherry, plum, and blackberry. Good acidity and a decently long finish. A great everyday wine, and a good value, which has some character. This wine would go well with pizza, BBQ or even a burger. Probably the best value wine of the tasting. Here are some other good wines from the tasting. On Wednesday, April 23, from 5-6pm, Salem Wine Imports will have a special wine tasting with Paolo di Marchi, an Italian Wine Maker of Isole e Olena fame in Tuscany. Paolo will be showcasing a number of his wines (Cepparello, Cabernet, Syrah, Chardonnay, Chianti, etc.). This should be an excellent tasting and a great opportunity to speak with someone who is considered one of the top wine makers in the world. I should also note that on Tuesday, April 22, at their regular wine tasting, the theme will be Sparkling wines, including Cava, Prosecco and Champagne. At many wine expos, there are often a few non-wine alcohols available as well, though often with some type of wine connection. One such mysterious example at UNLVino was Ty Ku, an intriguing new liquer. It ia partially mysterious as the marketing appears directed to that end. For example, they do not provide you a full list of the ingredients in Ty Ku. Plus, some of the links on their website, especially the FAQ and Media Sheet, do not work. Thus, there is not a lot of concrete information about the product. It is a green-colored liquer that comes in a frosted, pyramidal bottle. The bottle also glows when you pick it up. So it is going to look interesting at a partially darkened bar when the bottle's light goes on. The liquer is a blend of about twenty different ingredients, allegedly all natural. Two of the ingredients are Saké and Vodka, though the liquer is only 40 proof. It is said that this may be the first Saké liquer. Of the other known ingredients, they include such items as yuzu, pomegranate, prickly pear, oolong tea, green tea, honeydew and plum. Plus, it includes ginseng, damiana and dragon's eye, all of which are so-called natural aphrodisiacs. Damiana is a shrub native to Central and South America and its leaves are thought to be an aphrodisiac. Dragon's eye, also known as longans, is a fruit that also is an alleged aphrodisiac. There are around 6-7 ingredients which are unknown. I should also mention that Ty Ku is supposed to be low in calories, unlike some of the more sugary liquers on the market. I tasted the Ty Ku straight, to find out its flavors as a stand alone. First, it definitely was not cloying sweet. There were more of a hint of sweetness and it felt more natural, more like the sweetness of good fruit. The liquer had an intriguing blend of fruit flavors, both exotic and familiar. I got a lot of melon and pear flavors, as well as touches of other herbal flavors. It presents more of a tropical taste and I did enjoy it. Though it probably would do best in cocktails rather than just straight. I cannot vouch for its alleged aphrodisiacs though. Their website presents plenty of cocktail recipes for the Ty Ku. It certainly seems versatile enough to mix with most anything. And it probably makes some good summertime cocktails. I think it is a very different liquer and I would recommend it. Ty Ku sells for around $30-35 for a 750 ml bottle. I am sure the glowing bottle contributes to a decent portion of its price. I don't think that was necessary as the Ty Ku could stand on its own as a good liquer. But gimmicks sometimes help sell products. Ty Ku is currently available in New York, Nevada, and the Virgin Islands though it will soon be available in other markets as well. OurGlass Wine Co. will be having a free wine tasting of 2005 Bordeaux this Saturday (April 19), from 2-5pm. The 2005 vintage is supposed to be an exceptional one so these Bordeaux wines should be sure to please. Kamen Estate Wines is owned by Robert Kamen, a screenwriter of films including “The Karate Kid” series, “The Fifth Element”, and the “Transporter” series. I met Robert at the tasting and he was animated, personable and obviously passionate about his wines. In 1980, Robert purchased about 280 acres of the southwestern slopes of the Mayacamas Range in Sonoma County. This land was rugged, overgrown, extremely rocky and very remote. There were no roads leading to it and there were no power lines either. If he wanted to transform the land, he had a long and laborious road ahead. But Robert had a desire to plant vineyards on this land, especially of Cabernet Sauvignon. So he brought in viticulturist Phil Coturri (of the Coturri Winery, one of my favorite wineries) to oversee this huge development. Both men shared a philosophy of preserving the wildness of the place with as little intervention as possible. This led to a commitment to organic farming, a rarity in those days. Once the vineyards were operational, and bearing fruit, Robert initially sold the grapes to other Sonoma wineries. But he eventually decided to try making his own wine. His first wine was a 1999 Cabernet Sauvignon. Today, Kamen Estate is located at elevations reaching 1100' to 1450' in the southwestern Mayacamas Range. The official appellation is Sonoma Valley, a smaller sub-appellation of Sonoma County. More specifically, the vineyards are on the southwestern slopes of Mt. Veeder. There are 36 acres of Cabernet Sauvignon, Cabernet Franc and Petit Verdot as well as a few acres of Syrah. 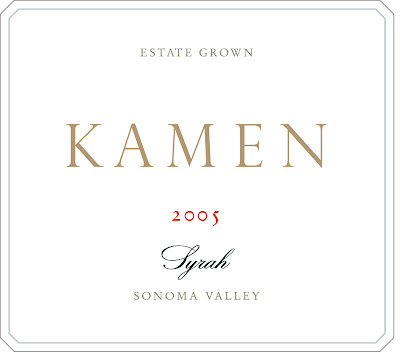 I only tasted the 2005 Kamen Syrah (about $70). Only 200 cases of this wine were produced and it was just released in March 2008. It is 100% Estate grown Syrah at elevations from 1100' to 1450' and has an alcohol content of 15.1%. The Syrah clone for their original planting came from Cote Rotie and Hermitage. In the 2005 vintage, the grapes were larger than usual and the fruit was incredibly lush resulting in very opulent wines. The Syrah was inky dark, so purple it almost seemed black. It had a compelling nose of black fruits, spice and cocoa. On the palate, it was a powerful, rich wine that was loaded with a myriad of flavors including ripe plum, blackberry, cocoa, coffee, licorice, spice, and a little vanilla. It was a lush, smooth wine where the tannins were well integrated in the wine. It had a lingering and satisfying finish. A complex, well balanced and delicious wine that definitely impresses. Certainly worth its price. I will seek out their Cabernet as well. Kamen wines are available in Massachusetts from Classic Wine Imports so they should be able to be found. I love Spanish wine so when I spied a few bottles at the Dreyfus, Ashby & Co. table, I had to stop. Dreyfus, Ashby & Co. is a wine importer and marketer with a portfolio of wines from all over the world. One of their wineries is the famous Miguel Torres. The Torres family traces its roots to the Penedes region of Spain back in 1870. Four generations later, Miguel A. Torres serves as its President. The company produces 3 million cases of wine and 1 million cases of brandy per year, with 60% of sales exported to 140 countries around the world. What really interested me was the 2005 Miguel Torres Salmos (about $25) from the renowned Priorat region of Spain. Most Priorat wines tend to be higher price point wines so it is unusual to see a Priorat wine at this level. But would it be any good? The Salmos is a blend of Garnacha Tinta, Syrah, Cariñena, Cabernet Sauvignon. It is fermented in stainless steel and then aged in new French oak for about nine months. It has an alcohol content of 14.5%. Interestingly, part of the original marketing for Salmos involved a mystery, ala "The DaVinci Code." The mystery was supposed to begin online and then could be followed up offline in Priorat. I don't think the mystery aspect went over too well as the new marketing materials I received ddid not make any reference to the mystery. The wine had a dark red color with a nice nose of dark berries with a hint of spice. On the palate, the wine was smooth, with mild tannins, and lush flavors of plum, blackberry, and spice. There were a couple of herbal notes and a toasty aspect. It had a moderately long finish and some decent complexity. I enjoyed this wine, especially at this price point for a Priorat wine. I think it would become even more interesting with a bit more aging. I would recommend this wine. I dropped by L'Andana for lunch and noted a few changes of interest. First, they now have a 3 Course Pre-Fixe menu for Lunch. For $22, you get a choice of Zuppa (soup) or Insalata, then a choice of one of three entrees (including a Strip Steak, Chicken Milanese, or Salmon) and then either Tiramisu or Gelato for dessert. Prior to my food arriving, we received two large slices of their usual warm bread. I previously noted that during Restaurant Week they had made some changes. Instead of giving you a bowl of oil and tomato, they already added it to the top of bread. They have returned back to the old way, giving you the bowl of oil and tomato and allowing you to smear it on your bread. I like that way much better and am glad they changed back to it. My Mom and I both had the Pre-Fixe. She had the Zuppa, a Mushroom soup, which she thought was excellent, with a nice, rich flavor. I had the Insalata which also was very good, with a lightly sweet Vin Santo dressing. Then she had the Strip Steak, a good-sized piece of beef, Rosemary fries. She enjoyed the steak very much and I had some as well. The steak was tender and flavorful. The fries were very thin, soft and tasty. Very different than their Truffle fries but very good. I had the Chicken Milanese, one of my favorite dishes, and it was as delicious as ever. As well as quite large. We both then ordered the Tiramisu. The Tiramisu was not presented as expected. It came in a sundae glass, with the pieces of ladyfingers at the bottom, layers of Mascarpone, a layer of chocolate sauce and shaved chocolate atop. We both loved this dessert. Everything blended well together without any one flavor overpowering the others. It was smooth and tasty, chocolaty and quite delicious. You definitely need to try their Tiramisu! Service was excellent as usual. At $22, I think this lunch is a very good deal. 3 courses, all good-sized, and the food is very tasty. You definitely save money over if you had ordered each course separately. Second, they also have a 3 course Pre-Fixe Menu for Dinner for $38 though I do not know the choices on that menu. Though I will be sure to check that out soon. Third, the Dinner menu has undergone a few other minor changes here and there. They have a couple new Appetizers such as a Scampi and Stuffed Artichoke. They don't have the Veal Milanese on the meny though do have the Chicken still. They also have a Lamb dish, a Braised Colorado Shank. Plus, they have a new Beef Rib Roast, in either a Single Cut or Double Cut. And that comes with a Warm Popover (one of my favorite breads!). There are even a few more Contornoi, including Olive Oil Whipped Potato and Wild Mushroom Risotto. I like that L'Andana continually makes some changes to their menu. It helps the restaurant from becoming stale, from giving you the same old choices all the time. And the quality of their food has remained consistently good. It continues to be one of my favorite restaurants. My new column of "A Passionate Foodie" can be found in the April 16 issue of the Stoneham Sun newspaper. This is a weekly column that concentrates on reviews of local restaurants though it may also touch on a few other food and wine topics. The new column has been published today and is also available online. The new column provides some suggestions on how to choose a good wine store. I point out some of factors that you should consider when seeking out such a wine store. Recently, I attended a local wine tasting where I met Doug Fletcher, the wine maker for Terlato Family Vineyards. I was very impressed with their wines so was interested when I saw a table for Terlato Wines International at the UNLVino tasting. Terlato Wines International is a huge wine marketing company, representing one out of every eight bottles of wine costing over $14. They represent some high quality brands and a few of them were available for tasting. Though they did not have any Terlato Family Vineyard wines that I had not tasted before, I did enjoy two other wines they had available. The first, and one of my top favorites of the entire tasting, was a 1997 M. Chapoutier Hermitage Monier de La Sizeranne (about $120). This Northern Rhone wine is predominately Syrah. The wine was a dark red, nearly purple, in color with an intriguing nose of dark berries and spice. It was clearly a very complex wine with an interesting mesh of plum, blackberry, vanilla, spice, and other flavors. Yet it all came in a subtle package where no single element overwhelmed. A very smooth and satisfying wine with a very long finish. This wine was superb and I could not get enough of it. At this price point, a wine better be impressive and this wine certainly was well worth its price. I give this my highest recommendation. The second, and also an impressive wine, was the 2005 Gaja Sito Moresco (about $70). From the Langhe region of Italy, this wine is a blend of 35% Nebbiolo, 35% Merlot and 30% Cabernet Sauvignon. Several estate-owned vineyards provide the grapes for Sito Moresco, among which is the twenty-five-acre Sito Moresco vineyard in Barbaresco. The name means "Moresco's site" and refers to the former owner of this vineyard. This also was a very dark red wine with a spicy nose. On the palate, the spicy tones were strong, though blended well with the dark fruit flavors. Some dark cherry, blueberry and blackberry notes. It was a smooth wine with a nice, long finish. It certainly had plenty of character and impressed me. It was richer than the Chapoutier though it is also much younger as well. The Moresco should age very well. Another wine I would recommend. Richard Partridge Wines is a small family owned winery in the Napa Valley with a limited production of Chardonnay and Cabernet Sauvignon. They source grapes from various Napa vineyards but have begun growing some of their own on their St. Helena estate to eventually make their own estate grown wines. I tasted their 2003 Richard Partridge Cabernet Sauvignon ($68). This wine is 100% Cabernet and the grapes come from two vineyards, Stanton and Sacrashe. The wine spent about 21 months in oak and has an alcohol content of 14%. Only 764 cases of this wine were produced. I should note that their 2005 Vintage is their current release and the 2003 is now regarded as a Library Wine. This wine has a moderate red color and a nose of cherry and raspberry. On the palate, it had vibrant red fruit, including a lot of cherry plus some raspberry and strawberry. There was a strong vanilla streak as well as some mild spice flavors, such as a touch of cinnamon. It had a decently long finish with some strong tannins. Overall, I enjoyed this wine but it did not really impress me. At this price point, I want to be impressed. I am looking for more than just a good wine. I want it to excel in some manner. And this wine failed to excel for me. You would enjoy drinking this wine, but it is not memorable enough for me to recommend at this price. I would be interested in their 2005 Cabernet though, to see if maybe the vintage matters. Justin Vineyards and Winery is an much acclaimed winery located in the Paso Robles region of California's Central Coast. It was established in 1981 by Justin and Deborah Baldwin. They chose to concentrate on Bordeaux-style blends and single varietals. Their vineyards total about 160 acres and they do source some grapes from other vineyards in Paso Robles. I have had a number of their wines in their past and I am usually very pleased with them. So, when I had the chance to taste a couple more, I made sure to taste them. 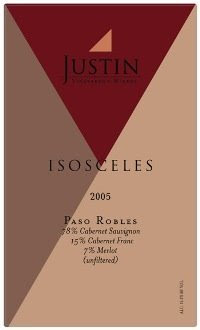 Justin Winery states that their "Isoceles" is their "soul." The Isoceles is a Bordeaux style blend made with every effort to creating a superb wine. I got to taste the 2005 Isoceles (about $62), which had just been bottled in December 2007 and which was only just coming on the market for sale. The 2005 Isoceles is a blend of 78% Cabernet Sauvignon, 15% Cabernet Franc, and 7% Merlot. The grapes were all hand harvested. It was aged for 24 months in French oak, 65% new. It is neither fined nor filtered and has an alcohol content of 14.6%. The Isoceles was a very dark red, almost purple, in color. It had an intriguing nose of plum, blackberry, vanilla and spice. It was a full bodied wine with a complex melange of flavors, including all that I smelled plus more, including blueberry, black cherry and some leather notes. It was well structured and had a deliciously smooth taste and a lingering finish that you did not want to end. The tannins almost seem nonexistent as they are so well balanced with everything else. Just an amazing wine that will only improve with age, though you certainly would greatly enjoy it even now. This is the type of wine that is well worth the splurge. I will definitely be seeking out a couple bottles for myself. 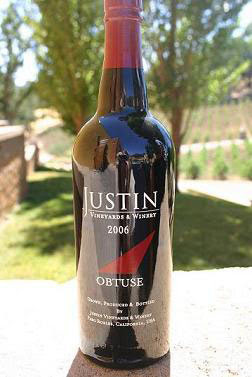 I also tried the 2006 Justin Obtuse, their port-like dessert wine. This wine is made from 100% Cabernet Sauvignon. The grapes were all hard harvested and the wine was fortified with a 170 proof un-aged grape brandy. The wine aged for about ten months in neutral French oak barrels. It was neither fined nor filtered and has an alcohol content of 18%. The wine had a light red color and an interesting nose of vibrant fruit, especialy cherry and raspberry. On the palate, it was lush wit plenty of red fruit flavors and a touch of cocoa. It was mildly sweet without being cloying. The sweetness thus did not detract from the myriad of flavors in the wine. This dessert wine would probably go well with chocolate desserts, or even on its own. Its rich flavors can be savored after dinner. I am a big fan of dessert wines made from red grapes and the Obtuse certainly is an excellent example of what such a dessert wine can show. Another definite recommendation. My first stop in the UNLVino Grand tasting was at the Chateau Julien table. By coincidence, I met their representative, Lisa, while having a crepe for breakfast. Due to the small number of available tables, Lisa and another wine rep asked to sit at my table as I had extra room. We got to talking and found out we were all going to the UNLVino tasting. So, I wanted to stop by her table to check out the wines. Chateau Julien established in 1983, is family owned and operated by Robert and Patty Brower. Their 16 acre estate is located in Carmel Valley, California. The winery produces three levels of wines: Private Reserve, Estate Vineyard and Barrel Selected. All of their grapes are grown locally in Monterey County's Lockwood Valley. Their winemakers are Bill Anderson and Marta Kraftzeck. Interestingly, Chateau Julien even has their own blog and has been doing so for over two years. 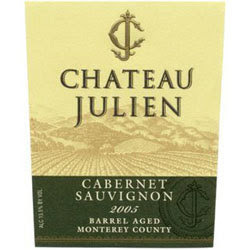 I first tasted their 2005 Chateau Julien Barrel Aged Cabernet Sauvignon (about $9). The Barrel Selected wines are their entry level wines and typically have mild tannins and forward fruit, making them very food-friendly and approachable upon release. The Barrel Selected wines are generally aged in one to three year old French and American oak barrels. This wine is made of 100% Cabernet Sauvignon. This is a good value wine. It definitely has good fruit up front, some black cherry and raspberry, and some nice spicy notes inlcuding a tinge of vanilla. The tannins are very smooth and it is an easy drinking wine. It has a bit of character, raising it up a level from the numerous one-dimensional wines at this price point. For under $10, this is a definite Drink & Buy. Certainly a good choice with BBQ coming in a couple months. 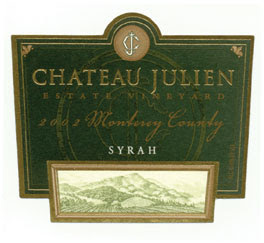 I then tried their 2004 Chateau Julien Estate Vineyard Syrah (about $18-20). This is their next level of wines. This wine is made from 100% Syrah. It was much lighter in color than many other Syrahs though it was more medium bodied on the palate. It had an intriguing spicy nose and that spice came out well on the palate too. Mixed with the spice were ripe flavors of plum and blackberry with vanilla streaks. The tannins were moderate and did not overwhelm. This is another wine that would go well with BBQ. It is not an intense, muscular Syrah but a milder wine though it does not lack in flavor. A good choice for the price. I do look forward to trying other wines from the Chateau Julien line. Back in February, I attended the Boston Wine Expo and my experience was a bit of a mixed bag. So, I was curious how the 34th Annual UNLVino Grand Tasting event would compare. They were similar types of tastings, both with well over 1000 wines available for tasting. Would I have to fight the crowds in Vegas like I did in Boston? Would Vegas be a much gaudier affair? The Grand Tasting was held on Saturday, April 5, at the Paris Las Vegas Hotel. Though the public tasting did not start until 2pm, the trade hours started at 12pm. With my press pass I was able to enter during the trade hours, when it should be quieter and easier to get to all of the tasting tables. Curiously, there was a long line of people waiting to enter during the trade hours. Based on my observations and hearing some people in line, it appears they may have permitted certain groups an early entry into the Grand Tasting, though they were not members of the trade. This is different from my experience at the Boston Wine Expo. The set-up of the tasting room provided plenty of space between the different rows of tables, far more space than is usually provided at the Boston Wine Expo. So, even when the crowds showed up later in the afternoon, the expo did not seem as crowded as the Boston expo gets. You actually could still access most of the tables with no more than a minimal wait. That certainly made the UNLVino expo more appealing. Food at the Boston expo is generally limited to the vendors on either sides of the hall. But there was plentiful food at the UNLVino expo. There were a few large tables with quite a diverse selection of foods and not just cheese and crackers. Plus, there were additional vendors at different tables giving away food, including sushi. This certainly would help people counteract some of the effects of all the wine that was available. The selection of available wines was generally comparable to that of the Boston Wine Expo, except that the UNLVino may have had more high end wines available. At the Boston Expo, many of those such wines are reserved for the Grand Cru Wine Tasting Lounge. As UNLVino does not have such a separate tasting for more expensive wines, then there is more of a mix in their Grand Tasting. Though, probably the majority of wines available were $25 or less. The UNLVino did have a small auction as well, in a room off of the main tasting hall. They only had about forty items and used both a silent and voice auction to sell the items. Nothing really appealed to me so I never bid on anything and did not attend the voice auction. Some of the items were local so they would not have done me much good back in Massachusetts. Nearly all of the wines up for auction were from California and none intrigued me enough for a bid. Though the Boston Wine Expo generally seems a more causal event, there were plenty of attendees at UNLVino who were dressed as if they were going out to a high end night club. And like the Boston Wine Expo, there seemed to be more women present than men. My friends, as did I, enjoyed themselves very much at the UNLVino tasting. Over the next couple weeks, I will post some tasting notes about the wines at the tasting which most impressed me. I certainly did not try all of the available wines, but I did try a fair share of different wines. And I certainly will head back to Vegas next year for the 35th edition of UNLVino. I would definitely recommend UNLVino to any wine lover who will happen to be in Vegas next April. I think the Boston Wine Expo could take some suggestions from UNLVino to make their grand tasting a better event. WBW #44: French Cabernet Franc-Ugh?